The forbidding and beautiful Alaskan wilds provide the backdrop for the legendary workhorse of the Alaskan bush: a De Havilland Beaver float plane. As the plane roars over the summer tundra, the icy river below rushes and tumbles its contents of glacial silt. On the distant horizon, America’s highest peak dominates the horizon. 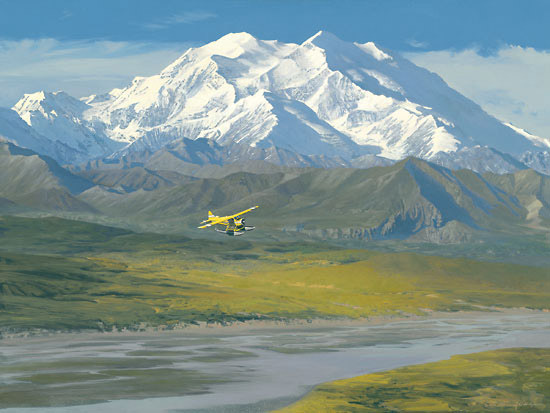 (Mount McKinley is also known as Denali, or “The High One,” in the language of the local people.) Mount McKinley’s scale is so massive that the mountain actually creates its own weather, and today its peak sparkles in the brilliant sunlight of one of the few cloudless days of the year.